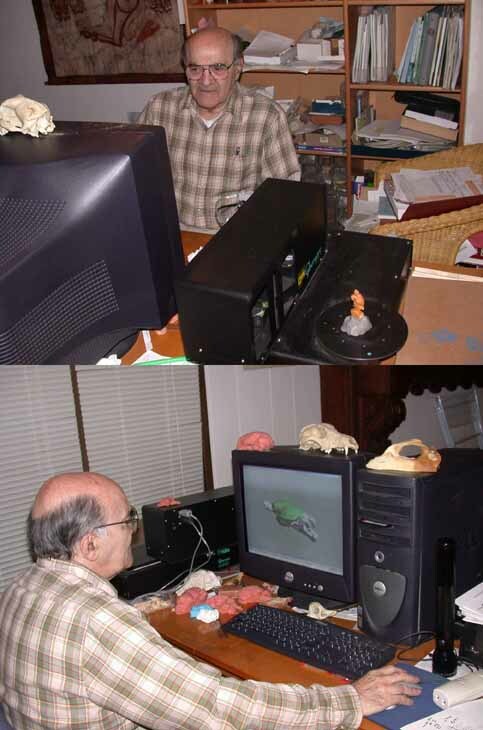 I’m at my computer, scanning brains and endocasts of living and fossil species. In the upper photo the back of a coyote’s skull is on top of the monitor. It’s also on the lower photo. The skull on the computer is of a wombat. The Cyberware 3D scanner is at my left. An endocast of an early primate (the Eocene Adapis parisiensis) is on the circular scanner platform. A 2D image of the scan is on the monitor in the lower photo. Scattered about are brain casts from the University of Wisconsin (pink), more skulls, and more endocasts (blue and white). For a more personal statement on my scientific orientation, see the pdf file of my 2001 essay in Falk & Gibson, listed in my online CV. My scientific work has been divided between studies of brain evolution, which is my main current work, and earlier studies of vigilance (sustained attention). Selected publications on these topics are listed in my online CV, with links to final drafts of a few recent publications as pdf files. Some of my data on brain evolution are illustrated below: the “brains” of two primates. Weighing an estimated 1.6kg, Adapis was a late Eocene relative of living lemurs. It lived about 40 million years ago. The 250-gram bushbaby, Galago, may still sometimes be spotted on an evening’s stroll in a South African forest. The laser scanner provides a digitized 3D image of the endocast (cast of the cranial cavity), which enables it to be analyzed quantitatively and compared with living brains. My wife Irene and I have also co-edited books on brain evolution. Rendered “virtual” endocast of the Eocene prosimian Adapis parisiensis and the brain of Galago crassidens. Endocast neocortical area (green) is dorsal to the rhinal fissure. Endocast from the Field Museum of Natural History in Chicago (FM 59259); brain from the University of Wisconsin (62-172): http://brainmuseum.org/; each about 10 ml in volume.